After nearly two years of questions, breathless media reports, and seemingly endless investigations, the primary findings of the Special Counsel’s report have finally been released, and the result couldn’t be worse for Democrats: The Trump campaign did not collude with foreign agents in the 2016 election. 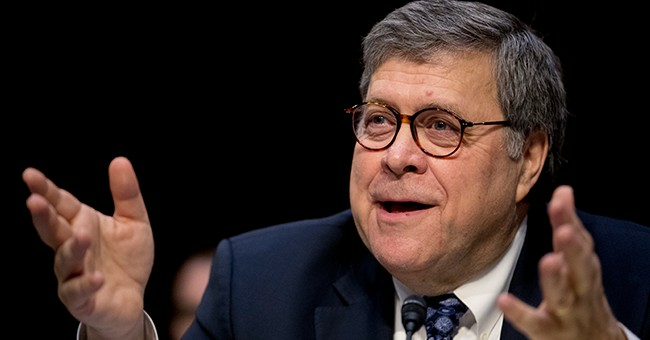 The letter further states that the Mueller report does not present a conclusion regarding allegations that the Trump administration obstructed justice in its handling of the Russia collusion investigation, but Attorney General William Barr and Assistant Attorney General Rod Rosenstein have concluded there is not sufficient evidence to warrant an obstruction of justice charge. In other words, President Trump’s repeated claims of a “witch hunt” appear to have been correct. Democrats and their mainstream media sycophants wailed for months that they had evidence showing Trump colluded with Russia—all the while ignoring the evidence that Hillary Clinton likely colluded with at least one foreign government. They were wrong. Congressional Democrats knew there was very little evidence pointing toward collusion, but they continued to confuse and mislead the public in order to score political points. Their disgraceful strategy worked, too. Despite a roaring economy, Democrats recaptured the House of Representatives for the first time in years in 2018. Is Donald Trump a saint? No. Has the president said and done things I wish he hadn’t? Yes, and I think most conservatives agree. However, Trump’s policy record is, from a conservative perspective, stellar, and all Americans, including minorities and women, are empirically much better off because of President Trump’s policies. The only reason Democrats created the Russian collusion narrative is because they knew it was their best shot at beating Trump and Republicans. They couldn’t win the policy debate, so they made Trump’s entire first year all about Russia, Russia, Russia. Simply put, Democrats lied to you, and they would do it all over again if they could, because congressional Democrats don’t care about anything except winning elections. As tempting as it is to focus on Democrats’ Russia misdeeds and their efforts to shield Hillary Clinton from serious scandals—especially her email and Benghazi cover-ups—the real takeaway for all Americans should be that you shouldn’t trust any of the promises congressional Democrats make, including those made by the Democrats running for president. When Democrats tell you that they can pay for their numerous new government programs by taxing millionaires and billionaires, don’t believe them. They have absolutely no way to pay for the tens of trillions of dollars in additional spending. In fact, even if they were to confiscate every penny belonging to every single billionaire in the entire world, it wouldn’t even pay for one-third of the cost of single-payer health care ($32 trillion) in just the first 10 years. When Democrats tell you that America will be a healthier and happier nation with government in charge of the health care system, don’t believe them. They know well that numerous problems exist in the countries that have adopted government-run or government-managed systems, including Canada and the United Kingdom. And don’t forget that congressional Democrats are the same folks who promised you while pitching Obamacare that if you like your doctor, you could keep him, and that millions of families would save more than $2,000 per year in Obamacare marketplaces. In reality, premiums have doubled since the Obamacare marketplaces opened, and deductibles are so high that many lower-income and middle-income Americans can’t afford to use their insurance plans. When Democrats tell you that the “Green New Deal” is necessary to stop catastrophic climate change 80 years in the future, don’t believe them. They’ve been making false doom-and-gloom predictions about climate change for decades. And more importantly, even if it’s true humans’ carbon dioxide emissions are causing global warming, nothing we do in the United States is going to reduce global CO2 emissions, because the rest of the world, especially China and India, are significantly increasing its own CO2 emissions to such a large degree that it will more than offset anything we do here over the next two decades. Democrats have repeatedly misled the American people. Hopefully, the Russian collusion misdirection will be a wake-up call to the millions of voters who continue to put their trust in the deceivers at the DNC.